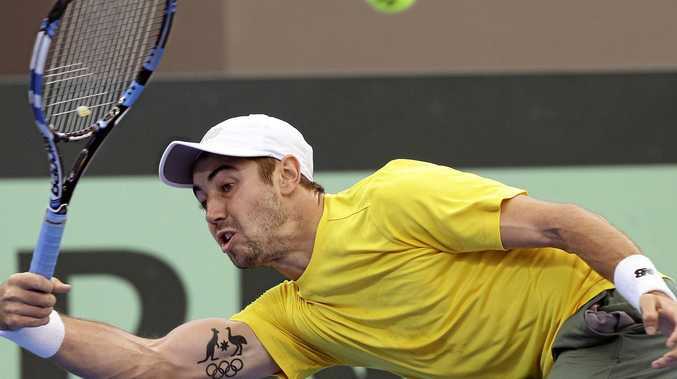 TENNIS: Sydney underdog Jordan Thompson has closed out a career-best win over world No.15 Jack Sock to break the Davis Cup quarter-final in Brisbane wide open for Australia. The super-fit Thompson ran down a tiring Sock in just over three hours to post a 6-3 3-6 7-6 (7-4) 6-4 win in the first match of the quarter-final against the United States at Pat Rafter Arena on Friday. The third-ranked Australian, who was given his Davis Cup opportunities this year only through the unavailability of Bernard Tomic, exposed a lack of match fitness in Sock, who had both thighs massaged when he went behind a break of serve in the fourth set. Thompson won both his two singles matches on debut against the Czech Republic in Australia's February tie, but with a No.79 ranking sits 64 places beneath Sock on the ATP standings. The win by Thompson, 22, set the Americans, the pre-tie betting favourites, back on their heels ahead of the clash between Australian Nick Kyrgios and American John Isner. Thompson's previous best win also came at Rafter Arena, when he beat world No.21 David Ferrer on the way to his first ATP quarter-final in Brisbane in January. The right-hander had won one match only since the February tie and also suffered an ankle injury, but has rallied when representing his country, pointing to a big tattoo on his right biceps of the Australian Olympic logo, inked after his Rio Games campaign last year. "There is no greater honour than to play for the green and gold and leave everything out there in Davis Cup," said Thompson, who is scheduled to play the fifth rubber on Sunday against Isner. Thompson's career accelerated last year when he won four Challenger titles, and also managed his first win in an ATP main-draw match, in Sydney. Sock arrived in Brisbane only on Monday, the same day as Kyrgios, and moved with less vigour and determination as the fourth set progressed. The 24-year-old American has already won two ATP titles this year and beat Grigor Dimitrov, the Brisbane International winner and Australian Open semi-finalist, two weeks ago. American captain Jim Courier had said publicly all week that he respected the tenacity and fitness of Thompson, especially in a competition with the Davis Cup's capacity for upsets. There could be no excuse for three lazy points played by Sock when he lost serve at 2-2 in the fourth set, giving even more confidence to his lower-ranked opponent. Sock served two double-faults, his sixth and seventh of the match, in the third set tiebreak. The counter-punching of the 22-year-old Sydneysider helped him save break points in the ninth and 11th games of the third set. Thompson's first serve velocity averaged out at 190kmh through the first three sets, with his fastest ball clocking 222kmh, and he moved eagerly at the back of the court.